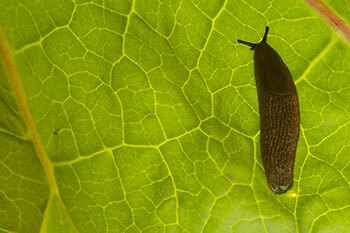 ​Slugs come in all sizes and many colours: from little grey ones to huge stripy green ones. Most live just under the surface of the soil. Scientific names for the most common species include: Milacidae, Deroceras and Arion. As seedlings mature, now is the time to get slugs under control, particularly in their favourite places: among the peas and beans, lettuces and tattie tubers. So tempting to whip out the blue pellets when faced with the ravages of the hungry slug. But there are other ways to live with these slippery customers. 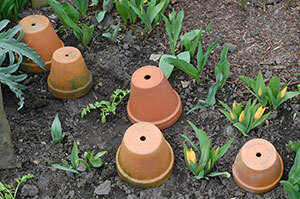 Small clay pots turned upside down in a shady spot on the plot will lure slugs into their cool interiors. Check regularly, picking out the slugs—despatch them by crushing them underfoot or drowning in salt water. You can get more complicated with ‘beer traps’ but the pot works just as well. Several works best. Sow seeds of particularly vulnerable veg (lettuce, beans of all kinds) in pots on a windowsill or greenhouse and plant out when strong enough to stand up to appetite of the slug. 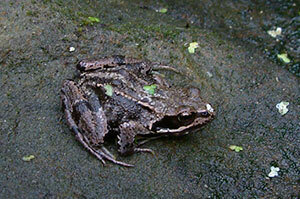 Create a small 'pond' in your plot to encourage toads and frogs who love to eat slugs. A half barrel or similar sized receptacle, either dug into the ground or free-standing, will do the trick. Place sunbathing stones/bricks into the water. No need for anything fancier. Water also attracts other beneficial insects such as hoverflies. Rake over soil and remove leaves in spring so that birds can feast on the exposed meal. 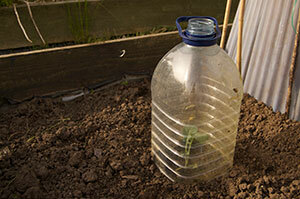 Use old plastic bottles to protect young plants from slugs as they are maturing. Once established, slugs are much less likely to create much damage. Pick over plants (and soil) regularly by hand and dispose of any slugs found. Slugs are most active late in the day/evening/night.